Brand - A livestock brand is a permanent mark on the hide of an animal. A brand is used for identification of ownership. While brands are applied to a variety of livestock and other animals, they are commonly known for being applied to cattle and horses. A brand can be a hot brand (made with a hot branding iron) or a freeze brand (made with a very cold branding iron). A branding iron has a handle, with a design or shape at the other end. When the design or shape is held against the hide of an animal the mark it leaves is a permanent form of identification (assuming the branding was done correctly, of course). A hot brand is made by using a hot branding iron. A hot branding iron is typically heated in an open fire, similar to a camp fire, or in a forge. 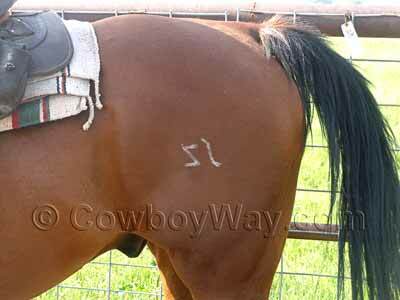 When a hot branding iron is applied to the hide of an animal it kills the hide's ability to grow hair in that area, thereby leaving a mark, or brand. Below: A hot brand on a horse. A freeze brand is made by using a very cold branding iron. A freeze branding iron is typically cooled by immersing it in liquid nitrogen; a combination of dry ice and alcohol; or a combination of dry ice and acetone. When a freeze branding iron is applied to the hide of an animal it kills the hide's ability to produce pigment in the hair grown in that area. With freeze branding, unlike hot branding, the hide still grows hair on the brand site, but the hair can no longer produce pigmentation so the hair on the branded area turns to white. For even more information about freeze brands, please see our articles What Is Freeze Branding? 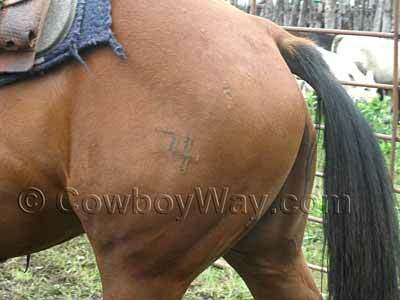 and Freeze Branding Horses. Below: A freeze brand on a horse.